I am in the passenger’s seat of a Chevy Silverado winding through the foothills of northeast Georgia, trying to learn the story of Carlos Lovell. But fifteen minutes into the drive, the man has barely uttered ten words from behind the wheel, and frankly, his deep, jowl-draped frown has silenced me in fear that the wrong question might land me in the ditch. The only sounds in the cab are Rush Limbaugh on the AM radio and the moan of the Chevy’s V8 pulling us up the narrow Habersham County mountain roads. Carlos Lovell is eighty-six, and this interview was definitely not his idea. I don’t think he even knows my name or whom I’m with; he never asked. He refers to me as “that reporter fella”—even when I’m standing five feet from him. He tells his employees I “ask too many questions.” At any rate, I get the feeling the old man would much rather be working. Besides, he has never been much of a talker. For almost half his life, his family’s income—not to mention his freedom—depended on discretion. Lovell was a moonshiner. At age sixteen, he started cooking illegal liquor and selling it by the truckload throughout North Georgia, right under the noses of local authorities. He and his brothers learned the practice from their father, Virgil, who himself had learned it from his uncle. Off and on for a hundred years, beginning in the 1860s, remote patches of these timberlands were thick with the warm scent of boiling corn and the thump, rattle, and hiss of a Lovell copper still. The Lovells were far from alone. Since the eighteenth century, alcohol was a common by-product of some American farms, not unlike butter or cheese that came from excess milk. Barrels of whiskey were more valuable than silos of corn. Some farmers kept it for themselves; others sold it. In colonial times, whiskey was bartered as hard currency. But in 1862, to help pay for the Civil War, the federal government reinstated an old tax on distilled spirits (President Jefferson Davis outlawed the production of liquor to save grain for the Confederate Army). After the war, homemade spirits were a major, if illegal, commodity in the devastated agrarian South. By 1880 the Internal Revenue Service was seizing about 1,000 illegal stills a year. In 1924, the height of Prohibition, 13,023 moonshine operations were broken up across the U.S., and 2,824—more than a fifth of them—were busted in Georgia alone. The prevalence of illicit booze in Georgia gave rise to the mythical Southern moonshiner in a souped-up jalopy, racing police through twisted mountain roads, past still fires strewn like Christmas lights across the Smokies and by Appalachian springs spouting pure white lightning. Even today, it’s not unheard of for hunters in these parts to stumble upon a woodland still—since 2011 the Georgia Department of Revenue has dismantled eleven, most of them small operations evidently used for private consumption. 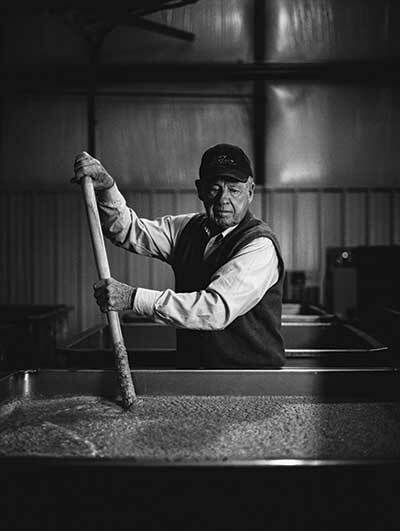 One night four years ago, as he tells it, Carlos Lovell rolled over in bed and decided that, after forty years out of the business, he would make whiskey again. And this time, he’d do it by the book. 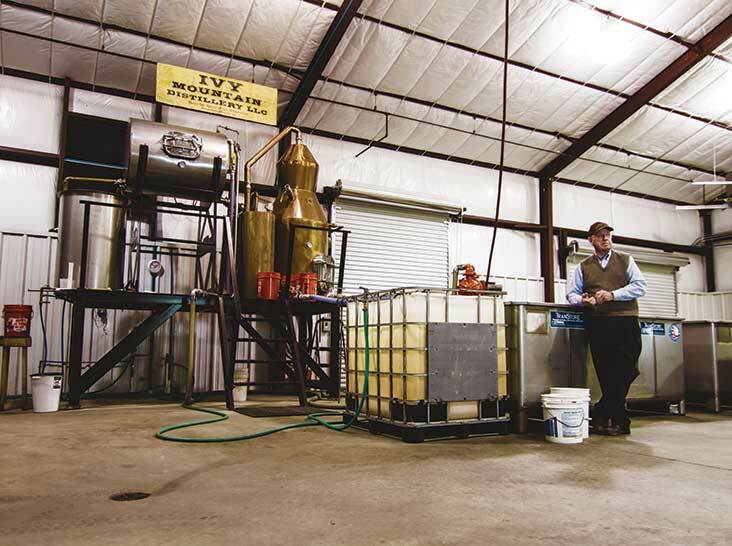 With savings from two decades of dealing in mountain real estate, Lovell built a distillery and expanded a warehouse right off of State Route 13, twenty-some miles from the old Lovell homestead on the outskirts of Clarkesville, the Habersham seat. 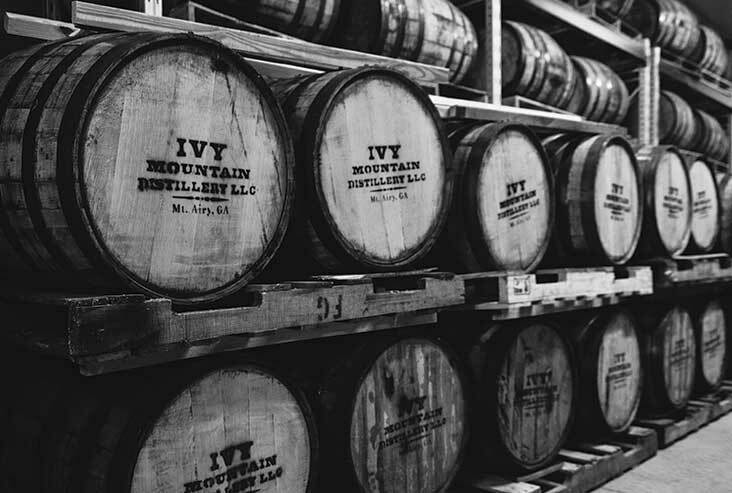 He plastered the name Ivy Mountain—site of several of his old stills—on the distillery’s water silo, slapped his guarantee of the 150-year-old family recipe right beneath his picture on the label, and waited for the cash to flow like the old days, now clean and easy. In one respect, Lovell’s timing could not have been more providential. After all, we are living in the age of the artisan, when the quest for “authenticity” means we’ll gladly pay $8 for a quart of lion’s mane mushrooms and $10 for a few ounces of fresh pasta. Why should our booze be any different? And what could be more “of-the-earth” than rediscovering the methods of hill folk who’ve crafted their own liquor for generations? But in many ways, the wilderness of the modern marketplace has been more ruthless than any booze-sniffing police dog or power-tripping revenue agent. The artisanal movement means Ivy Mountain Georgia Sour Mash Whiskey is competing for shelf space not only with the barrel-chested Jack Daniels and Jim Beam, but also with a cluster of other like-minded boutique distilleries that have sprouted all over the region. In Lovell’s mind, the whiskey itself, born of experience and instinct that reaches back through his bloodline, processed with hard work and care, and sold for an honest price, should be enough to set Ivy Mountain apart. But his daughter, his employees, and the marketing firm they hired know that nowadays consumers pay for image as much as product. They believe people will line up to buy “legal moonshine” straight from the mountain still of a Georgia legend. They just need to know the legend. That’s why they’re prodding Lovell to lead public tours of his distillery, why they have this farmer who sprouts and grinds his own corn slouched behind a fold-up table at Costco, signing bottles of his 86-proof lifeblood alongside the hair-netted warehouse club employees who hawk toothpick meatballs and samples of granola. The Lovells age their whiskey in charred oak barrels to give the spirit a smoky finish. We climb down from the truck, and Lovell leads me, sans blindfold, through the trees and across the hillside to a squat stone springhouse dating to the mid-1800s. Behind the building, a stream of cold, clear water runs downhill. Lovell tells me that, for a couple of decades while he was retired, he leased this land to a company that bottled it as drinking water. There’s unmistakable pride in his voice, but I also detect a touch of disdain—as if using the water for that purpose had been a terrible waste. One name he invokes repeatedly is his father’s. Virgil Lovell was a farmer who raised Carlos and his six brothers and three sisters in a nineteen-room Habersham County farmhouse. Virgil was not wealthy, but he was never broke, and he used his whiskey as barter. As far back as Carlos can remember, there were wooden barrels of liquor aging at the back of the Lovell property, and he rarely saw Virgil drinking it. The subject was strictly taboo. By the time Carlos was in his mid-teens, during the 1940s, there weren’t many ways for a young man to make money in northeast Georgia. The mechanization of farm and mining work had lessened the need for hired hands. Country boys migrated to factory jobs in the city, or they stayed to work their own farms or in the sawmill—neither of which brought in enough money for the Lovell boys’ tastes. So when Carlos and his brother Fred were sixteen and fourteen, respectively, Virgil let them in on the family business. Compared to the fresh-off-the-still paint thinner hooch that hasty moonshiners jarred, Virgil’s recipe was sophisticated: He aged it in barrels, which gave the spirit a caramel color and taste not unlike bourbon. Carlos would one day hear that his father’s corn mash was good enough that it was even served in the governor’s mansion. Whiskey in the barrel, Virgil told them, is like money in the bank. When Carlos Lovell opened Ivy Mountain, his younger brother Fred (left) showed up. “He just walked in and started working,” says Carlos. 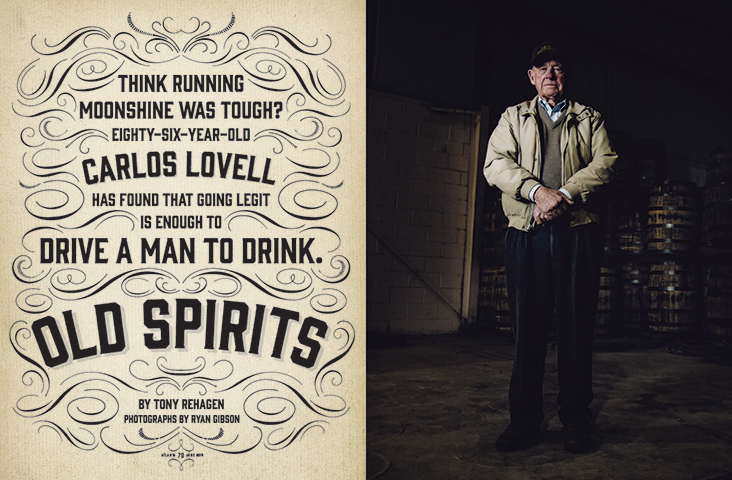 Like most moonshiners of the time, the Lovell brothers had to sell their product days, even hours, off the still, when it was clear—hence the nickname “white lightning.” Carlos, especially, embellished Virgil’s recipe, much to his father’s chagrin, using sugar to speed up the process. He also started watering down the booze to 80-proof (40 percent alcohol) or lower, stretching each batch. “It wasn’t worth a damn,” he admits now. But that’s not exactly true. Soon the Lovells were making and moving twenty-five to thirty-five cases (as much as 210 gallons) of a dozen full Mason jars a day, at $18 to $20 a case. During the boom times in the 1950s, there could be tens of thousands of dollars hidden in pillowcases or buried around the Lovell property. Bootlegging’s economic impact was undeniable: Whiskey makers bought lumber from the sawmill and equipment from the local hardware stores. They hired trusted hands to help cook and haul and load onto runners’ tarp-covered flatbeds. A few dollars also went into the collection plate on Sunday. Law enforcement was a tougher sell. Carlos says there was a mutual respect between the moonshiners and local police—who pretty much knew who was cooking and where. Even so, every few months, agents would surprise the Lovells with shotguns and dynamite for the stills on midnight raids. Authorities recruited basketball players from local colleges—“fast as red foxes,” says Carlos—to help run down scofflaws. But the Lovells were fast, too, and knew the woods well enough to slip away. Eventually the boys bought their own homes down the mountain from their father. Carlos started a family. His daughter, Carlene Holder, remembers stacks of empty jars in the basement. “I always knew Daddy made liquor,” she says. “But it was never discussed.” Growing up, Holder could invite over only certain friends, those whose parents knew her father’s secret, and even then, they were allowed to play only in certain places. Once, a fellow student referred to her father as “the liquor maker” in front of the whole class. Holder was terrified that her father might get caught. One night in the early 1960s, Holder was awoken by police lights. She sat on the hope chest beneath her window as the cars sped past her house and stopped at Uncle Fred’s down the road. Agents searched Fred’s garage and found 1,200 gallons of shine. There was nowhere to run. Fred got five years’ probation for the sale of untaxed spirits. Carlos narrowly escaped prosecution due to a technicality, but he knew his time was running out. By then, the proliferation of airplanes had made stills easier to spot, and the government had started tracking large purchases of ingredients like yeast and malt, even sugar. Before long, Carlos followed his brother into early retirement. For the first time in a hundred years, the Lovells were out of the liquor business. With his bootlegging money, Carlos had been buying up land around Habersham County, and he eventually turned to developing and selling that and other mountain property. He and Fred also built up their farms—once essentially fronts—and invested in more cattle and chickens. They leased the family spring to the bottled water company. Decades passed. Carlos gradually settled in to his living-room recliner. Technically, he was right. But it was far from simple. Banks, still smarting from the Great Recession, turned down Holder’s loan application. Even the Small Business Administration was of no help. Because the U.S. Alcohol and Tobacco Tax and Trade Bureau required all equipment to be bought and assembled for inspection before it issued an operating permit, Carlos and Holder had to dig into their savings and retirements. They told me that their up-front investment was in the “hundreds of thousands of dollars” to construct a distillery—an exponentially larger replica of the old woodland stills—practically on spec, not knowing whether it would ever legally produce a drop. That permit process—actually three separate applications for federal, state, and county certifications—took almost an entire year. Ivy Mountain was up and running in early 2012. But the fledgling company did not have a corner on the market. In 2003 the American Distilling Institute counted about seventy microdistilleries in the U.S. Ten years later there were more than 400, including twelve in Georgia. 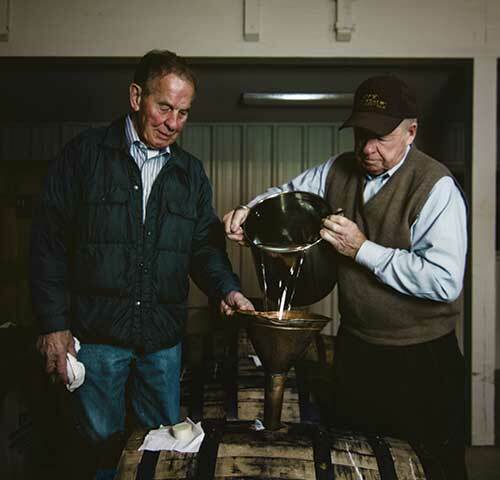 When it comes to whiskey making, there is no substitute for patience. While it takes only four to five days to mix, ferment, and distill corn mash into liquor, whiskey has to sit in wooden barrels for months or years to acquire the caramel color and the mellow, smoky flavor that distinguished Virgil’s brand. For an independent owner, that’s a long time to go with no cash flow. Some microdistilleries navigate the lag time by pumping out vodka, gin, and fruit brandies—clearer liquors that don’t require aging—while their dreams of joining the aged small-batch whiskey craze mature in the storeroom. But many small distillers, north and south, have taken a cue from the Southern farmer and started bottling and selling moonshine, spawning a submovement within the craft distillery world. Suddenly it was cool to serve clear corn liquor from jars and use white dog and white lightning as mixers in cocktails. Carlos stirs with a six-foot sour wood smash stick. As more distillers have hung out their shingles, entire package store shelves have become devoted to moonshine. Of the seven Georgia distilleries that make corn whiskey, most of them market it with at least a nod to the old mountain culture: a moon on the label, selling it in jars, calling it “moonshine,” even dressing up in hillbilly beards and overalls at tastings—whether or not the makers actually have any bootlegging roots. Ironically, Carlos, one of the few who have a legitimate claim to slinging illegitimate hooch, is reluctant to play up his outlaw past. Ivy Mountain does bottle a white whiskey, along with apple and peach brandies, to keep the still running. But there isn’t so much as a crescent on the label, much less the m-word. “Carlos wouldn’t have it,” says Michael Yearwood, whom Carlos hired to run the day-to-day operations. “To him, ‘moonshine’ means ‘crap,’” no better than the swill Carlos was turning around for a quick buck back in the 1940s. Ivy Mountain’s white liquor—Virgil’s raw, unaged recipe, sold as simply Georgia Sour Mash—is a much higher quality than the watered-down rotgut of Carlos’s youth, with a surprisingly smooth finish after the initially sharp corn bite. And, according to Holder, its sales have helped keep Ivy Mountain afloat, if not yet made it profitable. But Carlos is eighty-six years old. He didn’t cash in his retirement to be part of a fad. He wants to make something that lasts. He’s fully invested personally and financially in his father’s recipe. Carlos doesn’t seem to believe that a story is going to set his product apart. (After all, how many people know who Jack Daniels or Jim Beam is?) He doesn’t care to drive into town, much less the city, for tastings at liquor stores; won’t don overalls; and has to be wrangled into more than a few terse sentences of anecdote. He is positive that all it will take to earn a drinker’s money and loyalty is one sip of his father’s whiskey. Fred Lovell, eighty-four, grinds his corn with a hand-operated mill. Most mornings Carlos Lovell arrives at the distillery by 6:30. He’ll wear slacks or corduroys, a white button-down shirt, maybe a windbreaker. Atop his head there’ll be a brown Ivy Mountain ball cap; the cowboy hat he’s wearing in the etching of his likeness on his bottles is nowhere to be seen. 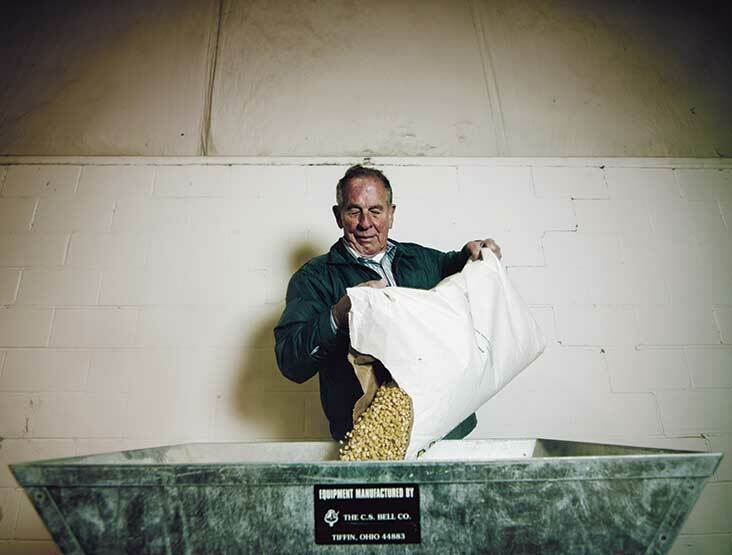 Biting down on his toothpick, he’ll bend to hoist a fifty-pound bag of sugar, which he slices open with his pocketknife above a 300-gallon vat of thick corn malt—ground by his brother, Fred, with a hand-operated mill—mixed with heated Lovell spring water. Carlos will dump in some barley malt and add a cup full of yeast to initiate fermentation while an industrial blender spins it all together. He’ll then step to another vat that has been fermenting for a few days and grab a six-foot sour wood mash stick, almost identical to those he used in the woods. Maybe he’ll pause to poke some fun at the assistant hauling everything around in a beeping forklift, then bend to carefully stir the brew, which is almost ready for the gas-fired copper still behind him. Fred shows up, too, most days. He’s not an investor. In fact, when he heard about his brother opening Ivy Mountain, “I thought he’d lost his damn mind,” Fred says. Carlos insists, almost proudly, he doesn’t pay Fred a dime. The brothers usually work in harmony, although, according to Yearwood, there is the occasional disagreement, usually over how Virgil Lovell would have done things. Sometimes the arguments erupt into all-out fights, ending with Fred calling Carlos a “hard-headed sumbitch” and disappearing for a couple of days. But he always comes back. Ivy Mountain is currently available in close to 100 stores throughout Georgia, South Carolina, and Florida, but the company has just shipped its first bottles to Texas and California, where it’ll be rebranded Lovell Bros. Georgia Sour Mash Whiskey to play up the family connection. As manager of the still, Yearwood’s job, aside from refereeing, is slowing Carlos down enough to learn the science behind the Lovell process—gauging temperature by thermometer rather than by hand, measuring proof with instruments rather than watching the beads gather on the surface of the liquid (more, smaller beads mean higher alcohol content—Carlos is amazingly accurate) or igniting the liquid with a blowtorch. Then when Yearwood, a former Army aircraft mechanic, surveys the data and discovers a place for improvement, the challenge is getting the “hard-headed sumbitch” to bend. But Carlos doesn’t spend much time in the warehouse among the aging spirits. At the end of his workday, usually around noon, he prefers his perch atop a rickety old wooden stool at the end of the still. He sits, arms folded, silently watching fresh whiskey run clear as crystal.